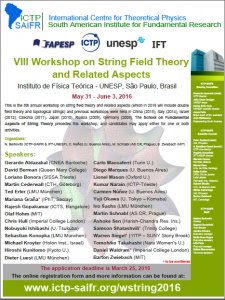 This is the 8th annual workshop on string field theory and related aspects (which in 2016 will include double field theory and topological strings) and previous workshops were held in China (2015), Italy (2014), Israel (2012), Czechia (2011), Japan (2010), Russia (2009), Germany (2008) . Registration: ALL participants and speakers should register. The registration will be on May 31 at the institute, from 9:30 to 10:15. You can find arrival instructions at http://www.ictp-saifr.org/?page_id=195. Participants who have registered on May 23, do not need to register again. Emergency number: 9 8233 8671 (from São Paulo city); +55 11 9 8233 8671 (from abroad), 11 9 8233 8671 (from outside São Paulo).